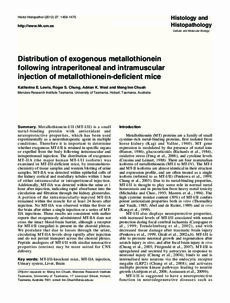 Metallothionein-I/II (MT-I/II) is a small metal-binding protein with antioxidant and neuroprotective properties, which has been used experimentally as a neurotherapeutic agent in multiple conditions. Therefore it is important to determine whether exogenous MT-I/II is retained in specific organs or expelled from the body following intramuscular and intraperitoneal injection. The distribution of exogenous MT-IIA (the major human MT-I/II isoform) was examined in MT-I/II-deficient mice, by immunohistochemistry of tissue samples and western blotting of urine samples. MT-IIA was detected within epithelial cells of the kidney cortical and medullary tubules within 1 hour of either intramuscular or intraperitoneal injection. Additionally, MT-IIA was detected within the urine at 1 hour after injection, indicating rapid absorbance into the circulation and filtration through the kidney glomerulus. A portion of the intramuscularly-injected MT-IIA remained within the muscle for at least 24 hours after injection. No MT-IIA was observed within the liver or the brain after either a single injection or a series of MT-IIA injections. These results are consistent with earlier reports that exogenously administered MT-IIA does not cross the intact blood-brain barrier, although a receptor for MT-I/II (megalin) is present in the choroid plexus. We postulate that due to losses through the urine, circulating MT-IIA levels drop rapidly after injection and do not permit transport across the choroid plexus. Peptide analogues of MT-I/II with similar neuroactive properties (emtins) may be more suited for CNS delivery.